Werner's Cairns blog: The pineapple is more than just a luscious sweet delight. The pineapple is more than just a luscious sweet delight. There are people who say that Queensland is “Gods own country.” Queensland is often nicknamed the Sunshine State, since it enjoys warm weather and a sizeable portion of the state is in the tropics. It can be beautiful one day, and perfect the next. All this may well lend itself to the fact that we grow the juiciest and the sweetest pineapples. So, it could also be said that the pineapple is the "Sunshine Fruit from the Sunshine State." Pineapple is one of those foods that is heaven to eat. A good, juicy ripe pineapple can satisfy a sweet craving as well as any chocolate bar. In addition to being a delicious food, Pineapple is loaded with Vitamins and Minerals. The obvious benefits of pineapple are all the vitamins and minerals the fruit is loaded with. Its nutrients include calcium, potassium, fibre, and vitamin C. In addition it is low in fat and cholesterol. We also grow a variety here in North Queensland called: “Mareeba Gold” for which the term “Brutal süß” would be an understatement. Click here for something different, a brilliant video clip; nothing to do with pineapples. This sticky and sweet tropical fruit is a favourite with children of all ages. The pineapple is a member of the bromeliad family and are composed of many flowers whose fruitlets are fused around a core. It is extremely rare that bromeliads produce edible fruit. The pineapple is the only available edible bromeliad today. It is a multiple fruit. One pineapple is actually made up of dozens of individual flowerets that grow together to form the entire fruit. Each fruitlet has an eye which is the spiny part on the pineapple's surface. Pineapples are both sweet and tart with a beautiful, tropical yellow colour, rem iniscent of warm summer days at the beach. They are also an integral part of sweet and sour sauce, you can't go past the wonderful pineapple. Click on picture to enlarge. Strengthens weak bones: One of the benefits of pineapple is that it helps to build healthy bones. Pineapples are rich in manganese, a trace mineral that is needed for your body to build bone and connective tissues. Just one cup of pineapple provides 73% of the daily recommended amount of manganese. The benefits of pineapple can effect the growth of bones in young people and the strengthening of bones in older people. Good for Gums: Your gums are very important to keep healthy. The gums hold the teeth in place and your teeth would be in bad condition if you have unhealthy gums. By eating pineapple, you are strengthening your gums to make it through the hard years later. Prevents Macular Degeneration: Pineapples contain a lot of beta-carotene that is good for the eyes and for your vision. Studies show that eating three or more helpings of pineapple a day may lower your chance of getting age-related macular degeneration, the main cause of vision loss in older folks. Pineapple and other fruit have been shown to be important in maintaining good eye health. Helps Arthritis: Bromelain is also considered an effective anti-inflammatory. Regular ingestion of at least one half cup of fresh pineapple daily is purported to relieve painful joints common to osteoarthritis. It produces mild pain relief. In Germany, bromelain is approved as a post-injury medication because it is thought to reduce inflammation and swelling. Bromelain can refer to one of two protease enzymes extracted from the plant family Bromeliaceae, or it can refer to a combination of those enzymes along with other compounds produced in an extract. 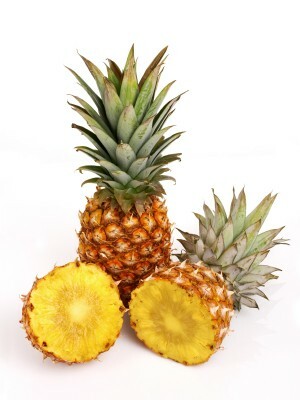 Bromelain is a proteolytic enzyme (an enzyme that digests proteins) found in fresh pineapple. It is often used to treat muscle injuries and as a digestive aid. Coughs and Colds: While many people often take extra vitamin C or drink extra orange juice when they have a cold, few consider eating pineapple. The benefits of pineapple when you have a cold or cough are the same as the benefits of orange juice, but there is an additional benefit of pineapple. Bromelain, which is found in pineapples, has been found to help suppress coughs and loosen mucus. Digestion: The bromelain found in pineapples aids in digestion. Eating one slice of pineapple after each meal will reduce gas, bloating, nausea, constipation and the symptoms of irritable bowel syndrome. Fresh pineapple juice also aids in removing intestinal worms. Sinusitis and Bronchitis: Bromelain has been shown helpful for upper respiratory tract infections such as Sinusitis and Bronchitis. Bromelain helps to reducing nasal inflammation and break up the mucus in the nasal, sinus and respiratory area. Blood Clots: Pineapples can help reduce the risk of blood clots due to the bromelain present in the fruit and thereby preventing heart problems. One of the most important enzymes in pineapples is Bromelain and it is this enzyme that holds the key to many of the pineapple's health benefits. Fresh pineapple is full of these sulphur-containing, protein-digesting compounds. So, what can it do for you? Bromelain has been found to be a useful anti-inflammatory, effective in reducing swelling and assisting in the treatment of conditions such as acute sinusitis, sore throat, arthritis and gout. For increased effectiveness, pineapple should be eaten between meals without other food. This is because of another of bromelaid's properties, that as an aid to digestion. If eaten with other food, bromelaid's health benefits will be taken up in helping to digest the other food. Pineapple is also an excellent source of manganese, a mineral essential in some of the enzymes necessary in the body for energy production. It also has very good amounts of thiamine (vitamin B1) which is also important in these energy producing enzymes. A very good source of vitamin C, pineapple offers your body an excellent protection against free-radicals, substances that attack healthy cells. A build up of free-radicals can lead to atherosclerosis and diabetic heart disease, an increase in asthma attacks and an increased risk of developing certain cancers, such as colon cancer. Free-radicals have also been shown to accentuate the problems associated with osteoarthritis and rheumatoid arthritis. Vitamin C, your body's most important water-soluble anti-oxidant has proven itself invaluable in fighting against and aiding treatment for these conditions. Vitamin C is, of course, also an excellent cold and flu fighter due to its importance to the proper functioning of the immune system. 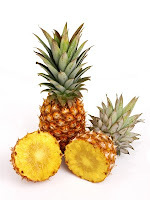 As pineapple stops ripening when picked, choose carefully and don't select one that looks immature. Pineapples can be stored at room temperature; however they spoil easily and should be watched carefully. To keep it longer than a day or two, wrap in a plastic bag and store in the refrigerator for up to five days. If you've cut your pineapple, store unused pieces in the refrigerator in an airtight container and use as soon as possible. They can be frozen, however this will change the flavour so be careful. When you eat pineapples, you have a better chance at having a healthier life. Doctors have been preaching the eating of fruits for centuries. There is always good things that come from fruits. Be aware of all the benefits of the fruit you eat so you know what you are lacking for the day. Our bodies need a certain amount of nutrients and vitamins a day. By eating fruit, we have a happy, healthier life. As we already know,pineapple is an excellent source of vitamins A, C and to a lesser extent, B. It is rich in manganese, which is an essential part of certain enzymes needed for metabolizing proteins and carbohydrates. Its enzyme Bromelain is used for digesting proteins. While thus digesting proteins, it gives some effective anti-inflammatory benefits. It is also known to both enhance the effectiveness of medical antibiotics and also to contain antibiotic potential itself. This has been observed in treating abscesses, pneumonia, kidney infection and bronchitis. Ripe pineapple contains about 10% fruit sugar. Its high chlorine content is a digestive aid. A glass of juice or a few pieces of pineapple after meals, relieve the digestive disorders of the dyspeptics. Its fresh juice soothes the throat. Pineapple juice is a specific for diphtheria. Pineapple is antiseptic and a gland regulator. It tends to reduce the acidity of urine. It helps in normalising menstruation. It is good for high blood pressure. It really has eye opening uses and benefits. An enzyme extracted from the stem of the pineapple is used for tenderizing meat. Liquid sugar for canning, citric acid for drinks and flavouring for pharmaceuticals are the by products from its juice. Very interesting Werner. I will be looking out for and buying "Mareeba Gold" as much as I can.